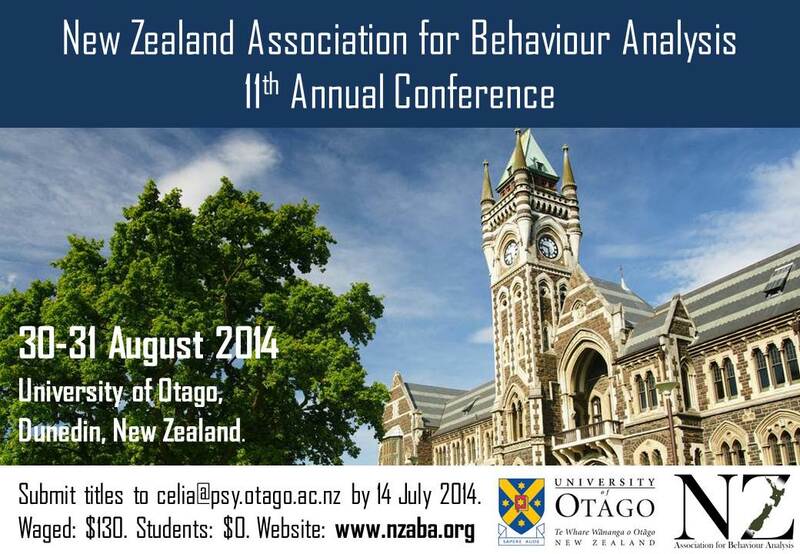 Here is the Call for Papers for the 2014 11th Annual New Zealand Association for Behaviour Analysis Conference, to be held on the weekend of August 30-31st at the University of Otago campus in Dunedin, New Zealand. There will be informal drinks on Friday 29th August, with papers and posters presented on Saturday 30th and Sunday 31st August. Please note that the deadline for title submissions is the 14th July 2014 (abstracts are not due until the 11th August). Please submit these to Celia Lie at celia@psy.otago.ac.nz. For all enquiries, please email Celia Lie directly. The conference is free for students and $130 for everyone else. Depending on the overall costs of this year’s NZABA conference, there may be limited funding available in 2014 for students who present a paper or poster to reimburse some travel costs. If you are unable to source alternative conference funding, please contact your supervisor who will apply to us on your behalf. Please note that funding will be made available after the conference to eligible students. Please forward this Call for Papers to anyone else you think may be interested in attending. Looking forward to seeing you all in Dunedin. Next Article PRE-REGISTRATIONS FOR NZABA NOW OPEN!